Tripp Lite's BC600SINE UPS system provides long-lasting battery backup for professional workstations, PCs, networking equipment and other sensitive electronics. Sine wave output in both line and battery power modes provides compatibility with all electronic loads, including PC and Mac systems fitted with Active Power Factor Corrected (PFC) power supplies. Uninterruptible Power Supply switches to battery derived sine wave AC output during power failures and severe voltage fluctuations so that connected equipment can be operated normally and shut down without data loss. Provides 18 minutes battery runtime with a typical desktop computer system (100 watts). Includes 3 battery-supported outlets for computer, monitor and one vital system peripheral, plus 3 additional surge suppression-only outlets for printers and other system accessories not requiring battery support. 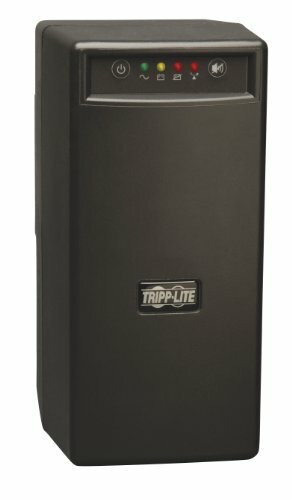 Built-in USB port enables data-saving unattended shutdown when used with Tripp Lite's PowerAlert software, available via FREE download from www.tripplite.com/poweralert. USB port also enables integration with built-in power management and auto shutdown features of Windows and Mac OS X. Built-in audible alarm and 4 front-panel LEDs indicate line power status, battery power status, overload status and battery low/replace status. 650VA/375W power handling ability supports professional workstations, desktop PCs, point-of-sale equipment, small business phone systems, audio/video equipment and home theater systems. Supports user battery replacement via built-in access panel.